My thoughts on House of Ivy & Sorrow are very mixed. There are sections and themes that worked really well. But there were elements that fell flat, tempering my enthusiasm. In the end, my feelings towards House of Ivy & Sorrow are simply that it was an okay read. House of Ivy & Sorrow focuses heavily on the importance of relationships, whether family, friendship or romantic. Each relationship that Josephine has is a connection that will prove to be her aid or her undoing. It gets explored throughout the novel, in various ways, and that really kept me interested. Independent choice is also foremost in the novel, particularly embodied in Josephine’s character. She knows of two choices from her upbringing, control (good) or consumption (bad). She knows of the sacrifices it takes to wield magic, and a variety of spells and traditions that she can rely on. However, when the most difficult choice of all presents itself, Josephine just takes matters into her own hands and decides to make her own way (her “option C”). Apart from the themes, however, House of Ivy & Sorrow felt typical. Josephine is a witch, who has to keep her family’s abilities a secret. Their family is being targeted by something evil, that threatens to Curse them, and when the evil comes to town, their whole front is torn apart. Josephine has two best friends, who have very different personalities (Kat’s more snarky, Gwen is more bubbly) who become pawns in the war between good and evil. There’s also nice boy Winn, who Josephine is interested in, and bad boy Levi, who turns her whole world upside down. These elements have appeared frequently in the YA novels I’ve read, so parts of this one were fairly predictable. I did, however, find the way magic is performed interesting (and also horrifying). Every spell requires a sacrifice, and it usually involves something physical (like blood, or a fingernail, or some hair). While crazy painful (seriously, there were scenes I gritted my teeth), it also made a lot of sense. I liked the magical charms, wards and possessions that crop up in this one too, but that could be because I’m fascinated by magic in general. Basically, House of Ivy & Sorrow had wonderful potential. It really surprised me with its interesting themes! However, I just didn’t connect well with any of the characters, including main character Josephine. It doesn’t help that the story is riddled with elements that are typical of many YA paranormal novels that I’ve read previously. While it was still pretty interesting, like I said, I would rate this one as just okay. 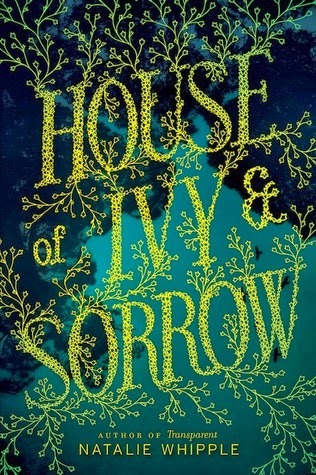 I feel like because it's been a wicked long time since I've read YA paranormal -- I'm mostly into contemp and fantasy these days, I'd probably like House Of Ivy & Sorrow quite a bit. Like, the gray area bits really appeal to me, ya know? I was interested in this book because of the cover. Sad that it's not as good as it seems. Great review! And a lovely blog! Hmmm. I have this for review but have been avoiding it because reviews have been similarly lackluster. I like a focus on relationship and themes of balance, but I'm worried about not connecting with this character, and I'm getting tired of these witch books. Is this a standalone? I spotted this one at my local and was excited because it really did sound interesting plus that cover is lovely. I like it when books put importance in relationships but I think it's more important to be able to connect to the main character. I might check this out sometime because it's been a long while since I last read a novel about witches but other than that, it really seems so-so. Thanks for sharing your honest thoughts, Alexa!